One of the hottest trends in the current economy is to remodel your existing home. A very popular project is to spruce up your bathrooms with new counters and faucet's using popular materials like brushed nickel and oil rubbed bronze. 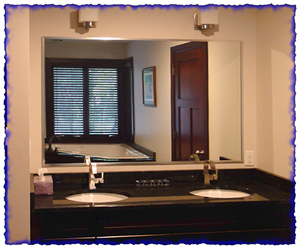 Let us update your mirrors and add a frame material with the same finish as your faucet's. We can even add a new matching shower door to complete the look. "The use of multiple mirrors to create the illusion of more space remains a popular choice for those with small bathrooms. What is the trend in the mirrors? Artistic Effects collecting mirror as small mirrors, or different mirrors in shape, or those framed in wood are becoming more and more popular." At Steele Glass and Mirror we have a large inventory of Mirror and various trim options and are ready to provide a new look for you.